Some of our patterns use duplicate stitch to add images or designs to a plain piece of knitting. It’s a really great technique to know because you can knit something plain and then add a motif or colour to it after you’ve finished the knitting. You embroider “knit” stitches on the base knitting with a darning needle. The embroidered stitches duplicate the look of knitting. Examples of our patterns which use duplicate stitch are the penguin sweater or the nursery block sweater which will be posted soon. Step 1: bring the needle up from below the stitch you will be duplicating. 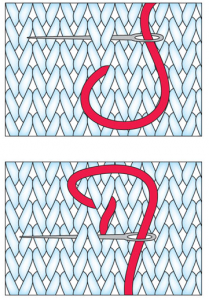 The insertion point is actually slightly below the bottom of the stitch. Step 2: insert the needle under the two legs of the stitch above the stitch you are duplicating. Insert the needle from right to left. Step 3: insert the needle back into the base of the stitch where you started. 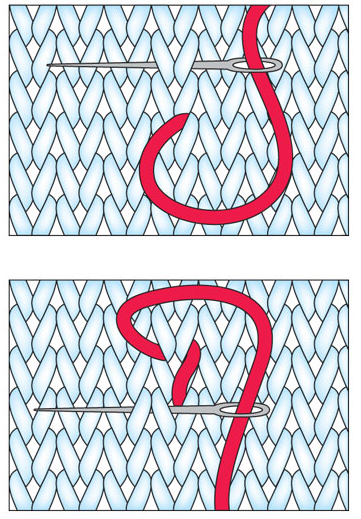 If you are going to duplicate the next stitch to the left you can get it started as shown in the diagram. surprisingly, you should use a thinner yarn than the base knitting yarn. Then the embroidery will look like part of the fabric. when you are covering large areas stitch work diagonally. if you need to cover a large area consider using intarsia instead – it gives a smoother result. try not to work vertical lines – they tend to dominate the work.